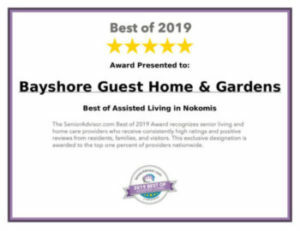 Bayshore Guest Home & Gardens has been awarded the distinction of Best Assisted Living in Nokomis 5 years in a row! We have recently doubled the amount of staff required by law. This enables us to provide optimized care for our critical care patients. Our swimming pool is well-suited for exercise and water therapy. Our gardens are perfect for relaxation and contemplation. Couples are welcome. Residents are encouraged to bring personal effects and furnishings with them to help enhance their lives and make them feel more at home. For more information about our facility, contact Bayshore today at 941-400-3847 or email leslieann@bayshoreguesthome.com.